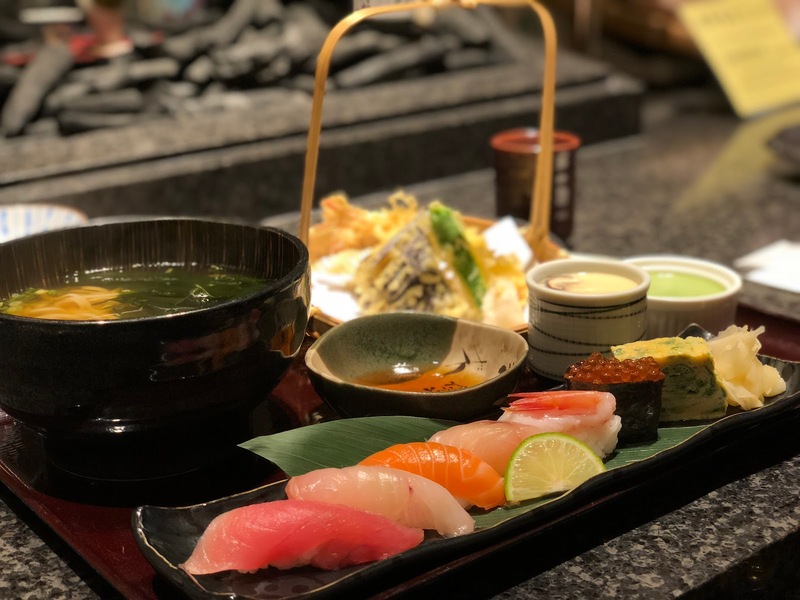 Ginza Kuroson Japanese restaurant is a hidden gem located at the third level in Ngee Ann City Shopping center. To be honest, we didn’t know that there is a Japanese restaurant and a baking school until P told us about it. 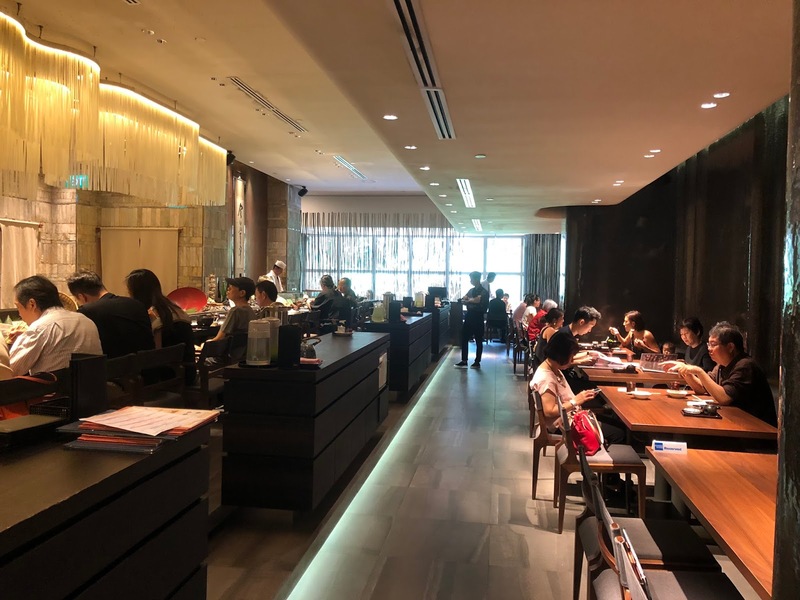 Although the price in menu can be a little steep at first glance, (8 pcs of sushi for $39.80), their lunch set is a lot more value for money. 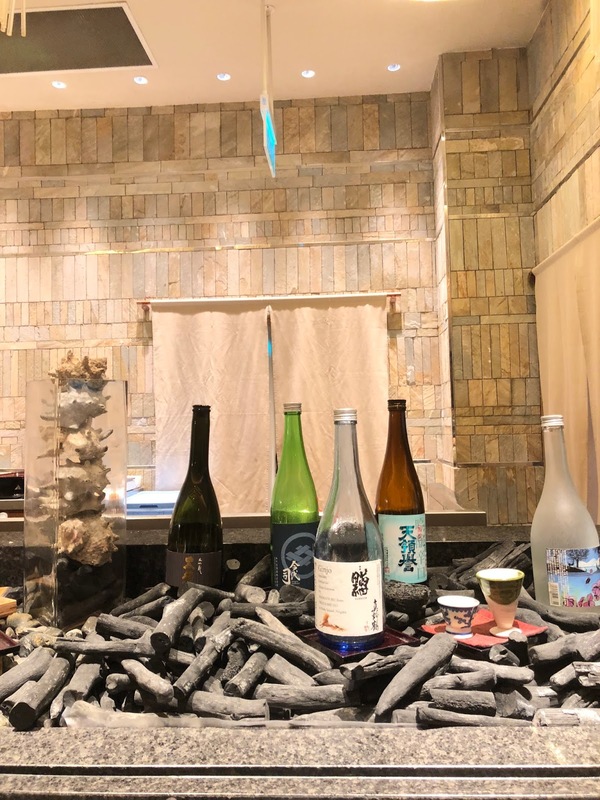 Along with fresh seafood and bottles of sake display at the counter, the restaurant has a Robatayaki counter. 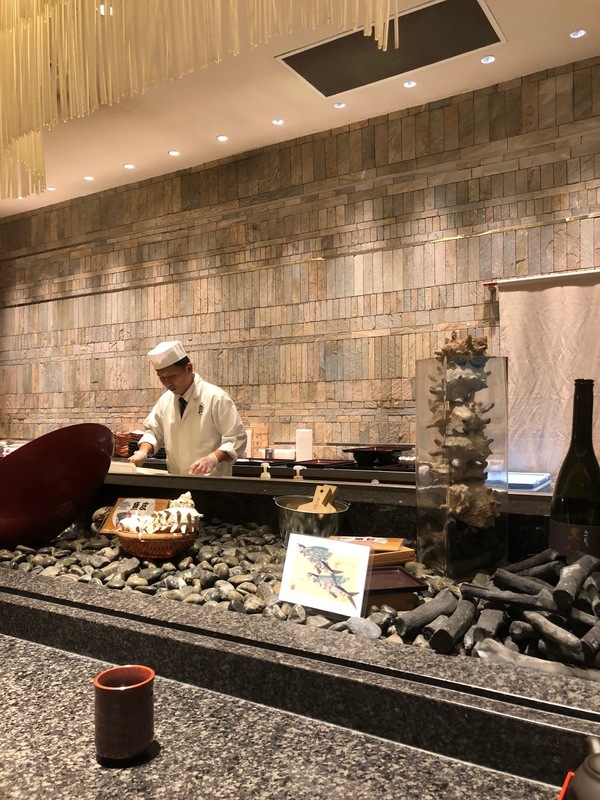 The Robatayaki counter are usually use by chef to grill food in a central position, giving diner an overall nostalgic experience. I ordered the Sushi & Udon set ($48) that comes with appetizers, 6 pcs sushi, Tempura, Udon (hot/cold) and a dessert. Salad was top with crispy biscuit and drizzled with Wafu sauce which we find it mediocre. Chawamushi was decent but nothing special. However, the Udon soup was surprisingly good. The noodle chewy and soup was full flavour. The star of the day got to be the sushi. The fresh sashimi was perfectly sliced and wrap with sushi rice. Unfortunately, the tempura was a huge let down. The batter was bland and oily. H ordered the Lunch Course Set meal ($68) and came with a series of surprises. First up, it was the Toufu that blow me away. 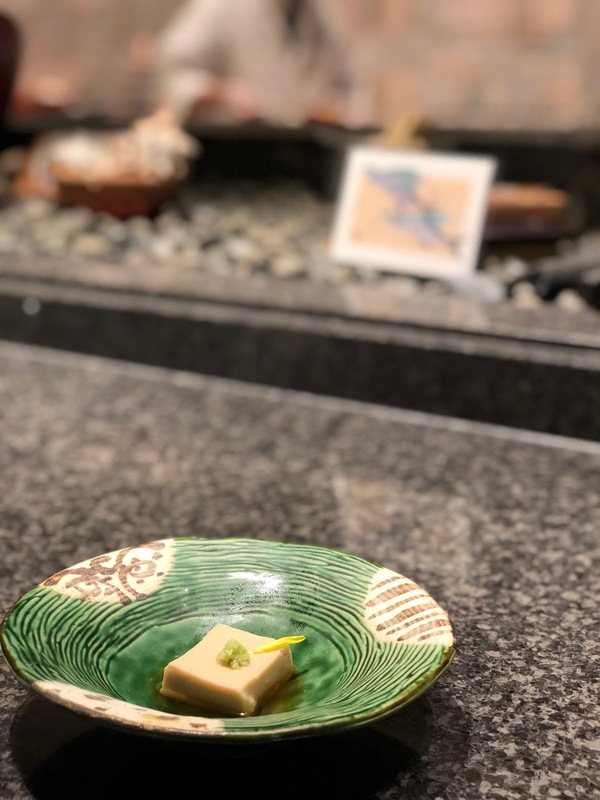 The Toufu tasted like pudding and is definitely better than the one i had at Teppei Omakase. The Toufu was light and creamy, left me wanting for more. Next, a bento filled with a appetizer and a plate of sashimi was served. 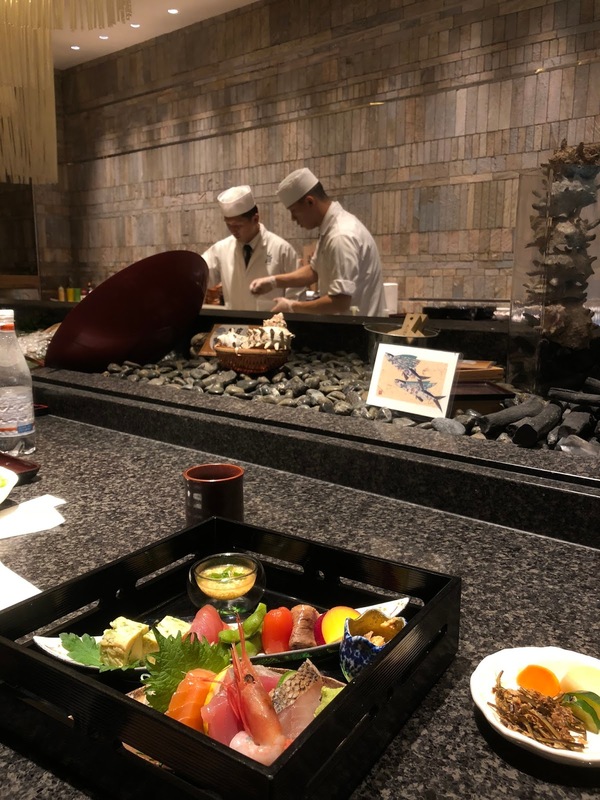 Although the bento box was not impressive, the sashimi was really fresh! 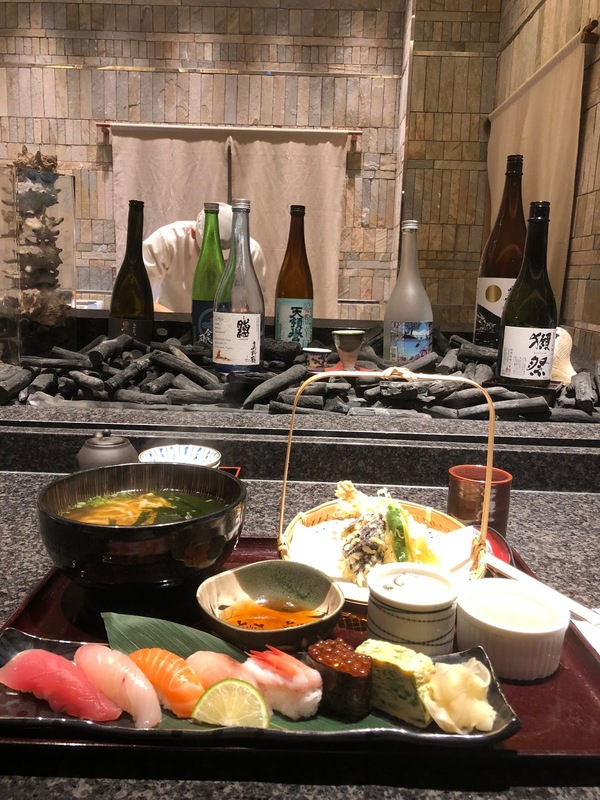 We read online that the sashimi were freshly flown in from Japan twice a week. Then, it was grilled salmon. 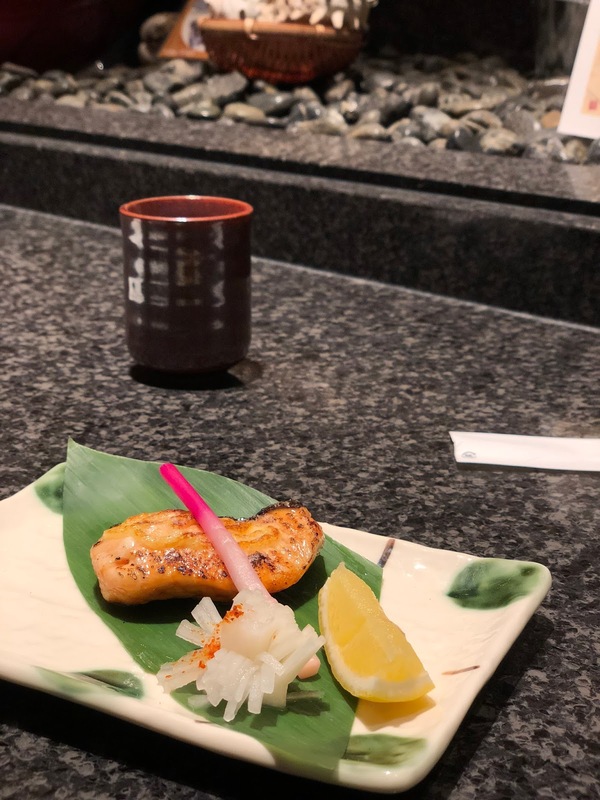 The salmon was grilled on the Robatayaki counter, making it even better than conventional ones! It is tender and not too oily. 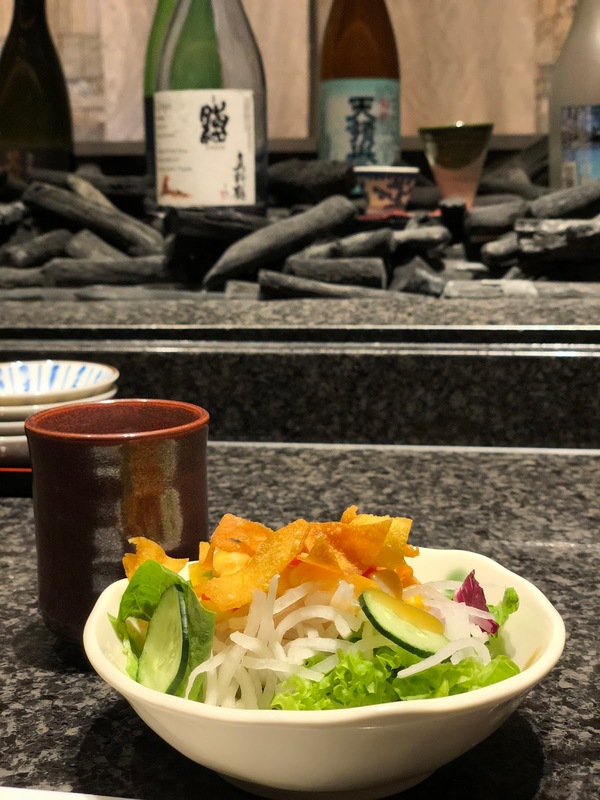 In addition, the set lunch comes with tempura which we find that it can be done better. 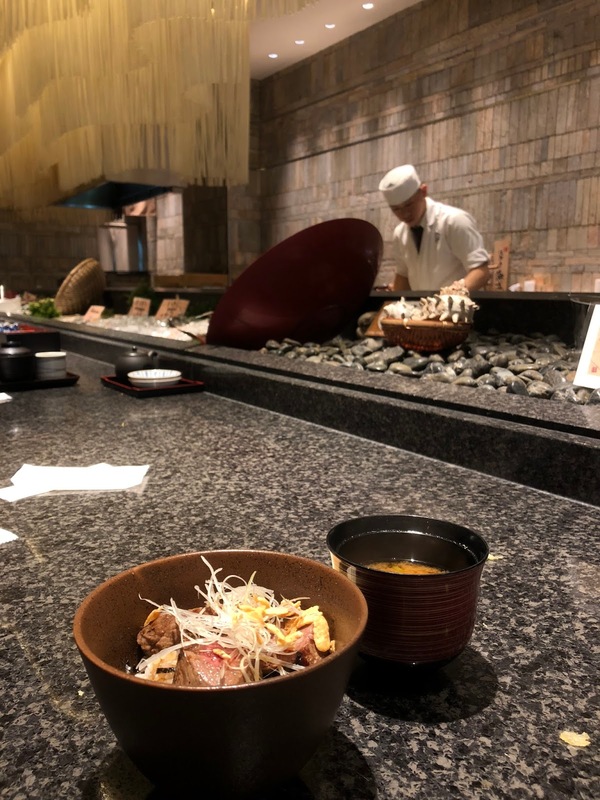 Lastly, a mini beef don was served. H had it in medium and it was tender and juicy. To end the meal, the 3 kind dessert was served. 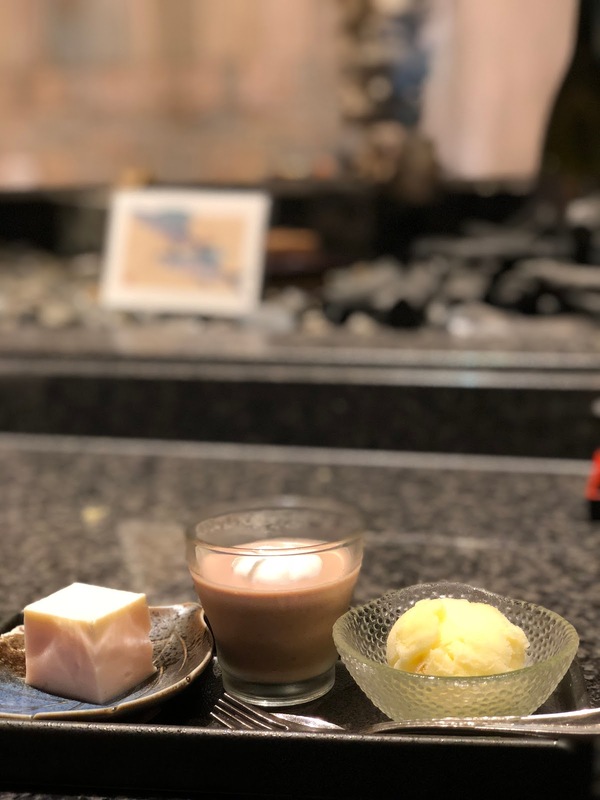 A cup of yuzu sorbet, chocolate mousse and toufu with strawberry was served as dessert. 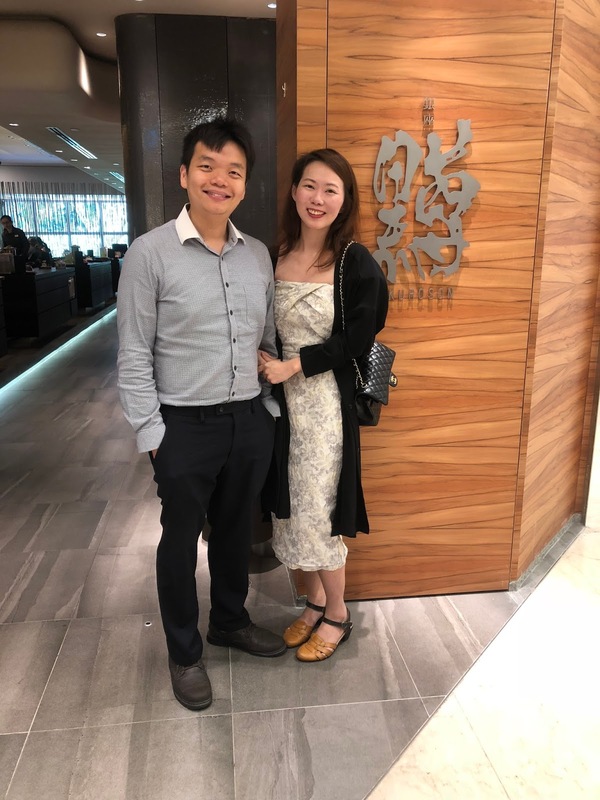 Although the lunch set ($68) is a little expensive, it is a pretty good choice to have for first timer. You get to try a little of everything. 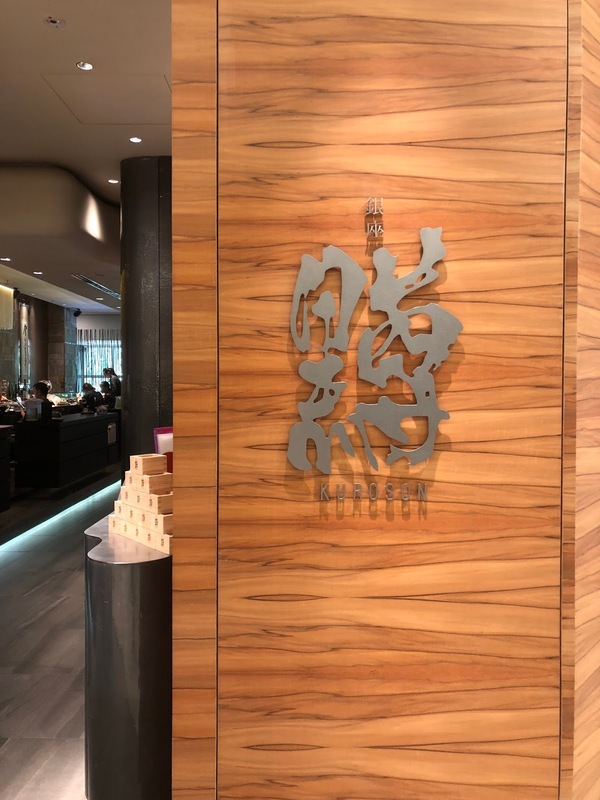 After this experience, we know we had to try its Lunch Donburi set next time! Will probably give the lunch set a missed since the only thing we like out of the entire set lunch was fresh sashimi, toufu and udon. Be sure to make reservation before you head down because when we arrive without any, that place is 3/4 full on a weekday afternoon.